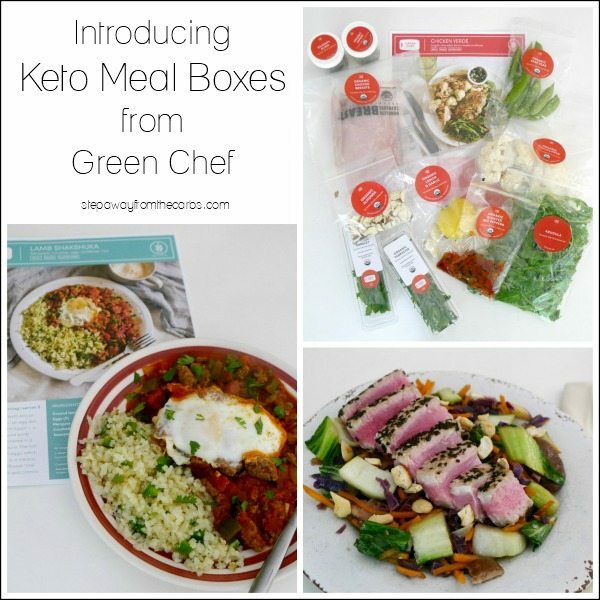 Did you know that Green Chef are now offering keto meal boxes? They are great quality and super convenient! Disclosure: I was provided with these meals from Green Chef free of charge in exchange for my fair and honest review. Please see my disclosure policy. This post also contains affiliate links, which means that at no extra cost to you I can make a tiny bit of money to help support this blog. Thank you! 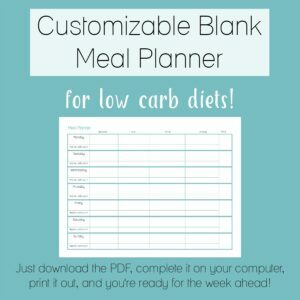 When I received the keto meal box, I was *really* impressed. 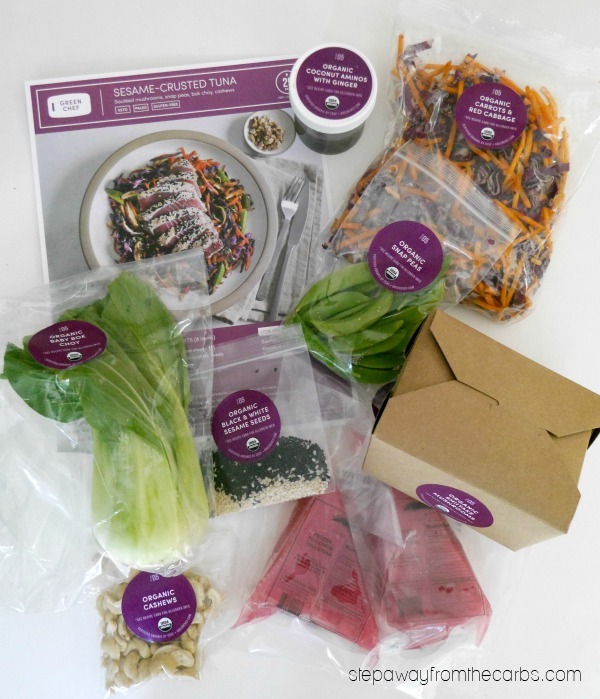 Firstly, the products were well packed and looked super fresh, and all the packing materials were either recyclable or compostable. As I took out the ingredients from the box, they all looked in perfect condition. And although I initially felt overwhelmed at the sight of all this food, I soon realized that the individual packets were color coded for each recipe. SUPER convenient and very user-friendly! 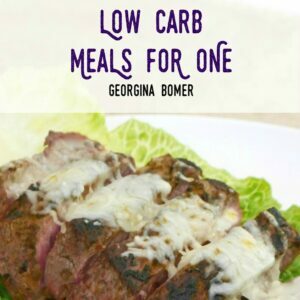 Each recipe has its own recipe card which details the ingredients needed from the box, any other ingredients not provided (always minimal – like oil, salt and pepper), and utensils required. I really couldn’t wait to get cooking!!! 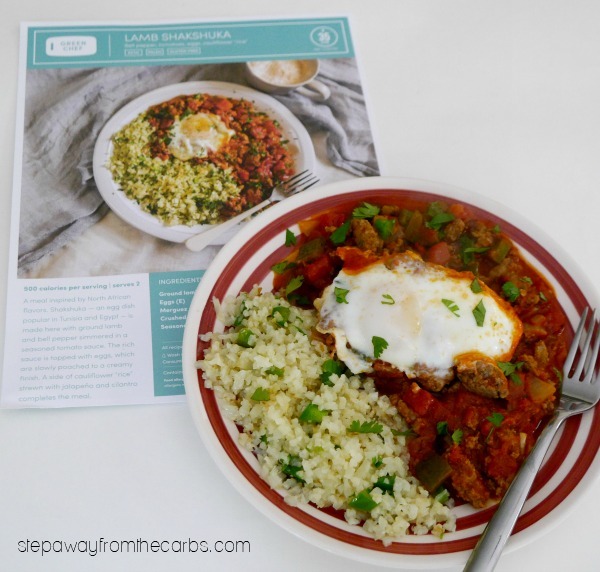 The first meal kit I tried was the Lamb Shakshuka. I don’t know very much about North African cooking so I was really excited to try this one. 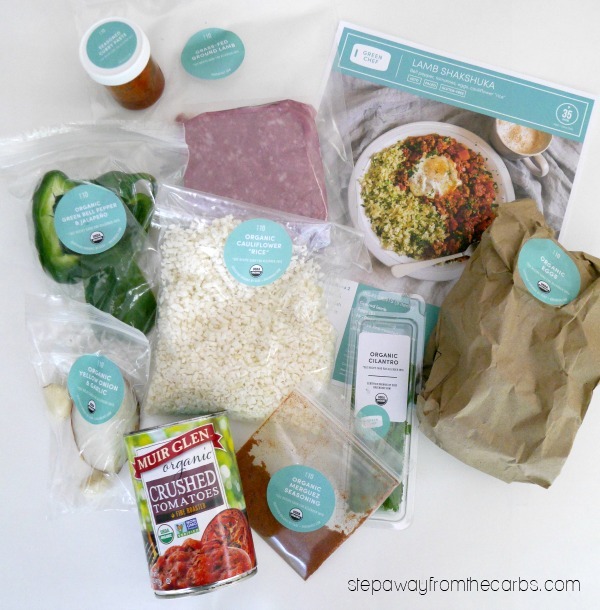 Ingredients include: ground lamb, eggs (which came in individual pods – very cute), Merguez seasoning, fire roasted tomatoes, curry paste, onion, garlic, green bell pepper, jalapeño, cauliflower rice, and cilantro. The instructions were super easy to follow, and the dish smelled and tasted fantastic. I loved how the egg was baked into the dish, and the spicy pop of jalapeño in the cauli rice was great. Other than having a different ratio of cauliflower to lamb, I think mine looked pretty much like the Green Chef photo!! Carbs for this dish are 20g net (find full details here) – which may be too high for some people. Most of those carbs are coming from the tomatoes, so I’m sure you could work around this by using only half the can and replacing with stock or broth. Next I tried the Sesame-crusted Tuna with Asian Veggies. 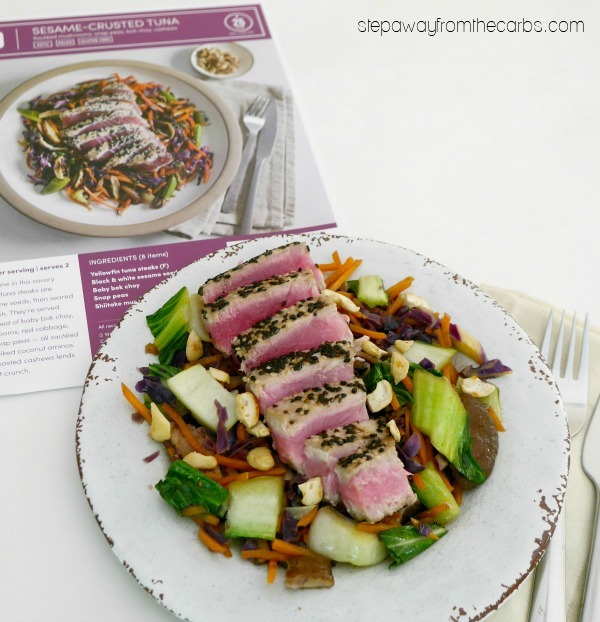 This meal kit included: wild-caught yellowfin tuna steak, black & white sesame seeds, baby bok choy, snap peas, shiitake mushrooms, carrots, red cabbage, coconut aminos with ginger, and cashews. Net carbs for this meal is 24g, which may also be too high. The carbs are from the snap peas and carrots – the peas were easy to leave out but the carrots were mixed in with the red cabbage, so I just gave myself a smaller portion. And finally I tried the Salsa Verde Chicken. 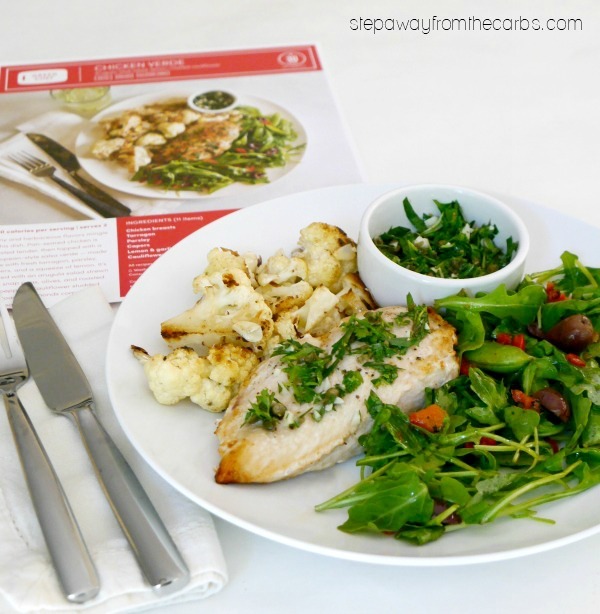 Included in the meal kit were chicken breasts, tarragon, capers, lemon, garlic, cauliflower, almonds, arugula, snap peas, kalamata olives, parsley and roasted red peppers. Carbohydrate count for this meal is only 10g net per serving, so I left the snap peas in. This was actually one of the trickier meals to cook, because of the four components: the roasted chicken, the lemon cauliflower, the salad, and the salsa verde. But the flavors really worked well together! I was a little bit unsure about the salsa verde because of the amount of raw garlic, but actually it tasted great (although we didn’t use all of it on the chicken). I’ve never tried cooking this way before – but I really enjoyed it! I simply had to follow the instructions, and reach for the pre-measured bag of ingredients. It was almost like painting-by-numbers – but with food! 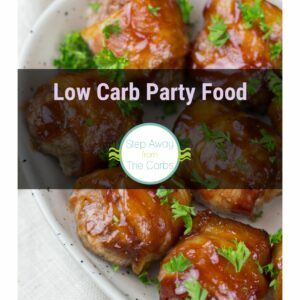 To see the latest Keto menu from Green Chef, click HERE and go to the green Get Started button. Costs are $14.99 per serving, plus $9 shipping and handling per box. 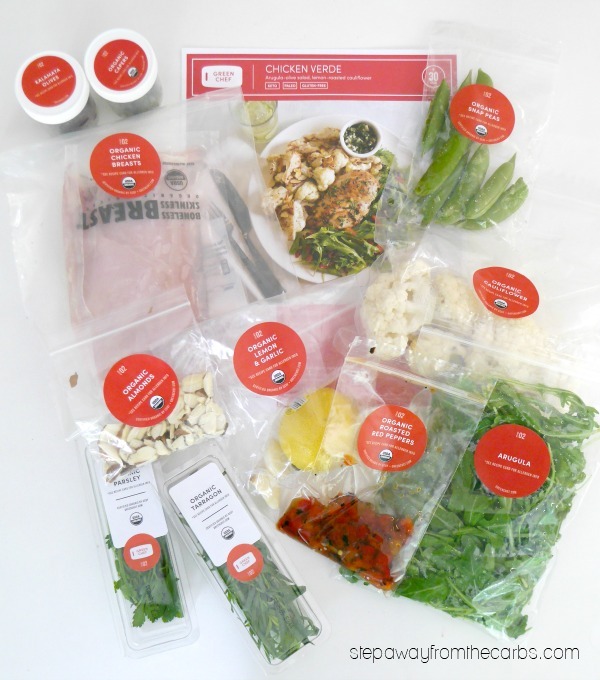 One box of Green Chef Keto includes 3 dinners to serve 2 people (6 servings total).